Chennai Super Kings (CSK) are all set to play against Rajasthan Royals (RR) in the match no 25 of VIVO Indian Premier League (IPL), 2019. The match will take place at RR team's home ground Sawai Mansingh Stadium, Jaipur. Last time when these two teams played in the match no 12 of IPL 2019 at MA Chidambaram stadium, Chennai won that match by 8 runs. RR was unable to chase down a total of 175 in their last encounter with Chennai. 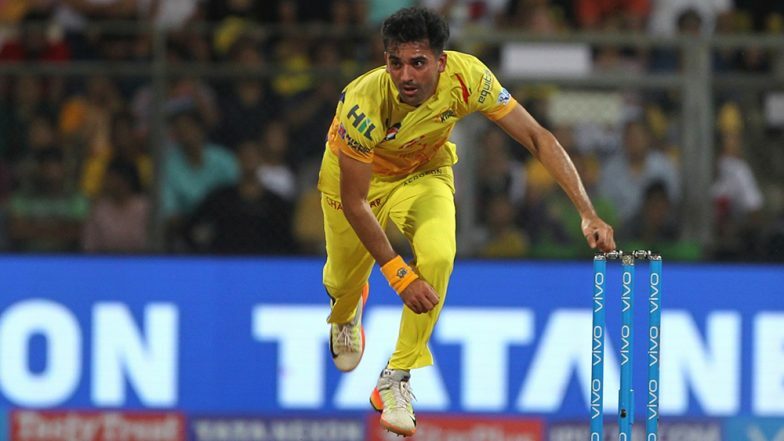 Ahead of RR vs CSK match, Chennai pacer Deepak Chahar shares his bowling plan against Rajasthan. IPL 2019 Today's Cricket Match Schedule, Start Time, Points Table, Live Streaming, Live Score of April 11 T20 Game and Highlights of Previous Match! Deepak Chahar bowled a brilliant spell against Kolkata Knight Riders (KKR) in Chennai's previous game of this season. The right arm medium fast bowler had a figure of 3/20 in four overs. He also created a record of 20 dot balls during a spell in IPL match, as the previous best of 19 dot balls were held by Munaf Patel, Ashish Nehra and Fidel Edwards. Deepak Chahar who is also known as Cherry plays for Rajasthan in domestic cricket, who is well aware of the track at Sawai Mansingh Stadium. Rajasthan Royals vs Chennai Super Kings Live Cricket Score 25th T20 Match. With Deepak Chahar in good touch and CSK being a spin-heavy side, Rajasthan will find it tough to defeat the defending champion. However, Rajasthan has registered only one win out of their six games in this season, which means that they will have to win matches now to back themselves to qualify for the playoff round. RR will hope that their opening batsman Jos Butler give Rajasthan inning a good start in the upcoming game against CSK.